Ballynagour may have been the beaten favourite when unplaced in the Byrne Group Plate last year but he made no mistake in the same race this afternoon, romping up the Cheltenham hill to score at odds of 12/1. The eight-year-old was always travelling powerfully under Tom Scudamore and he produced a mighty leap at the last to leave his rivals toiling and land an eight length victory. Trainer David Pipe, who was recording a 51/1 double on the third day of The Festival following Dynaste's victory in the Ryanair Chase, was quick to praise the staff back at his Pond House yard near Wellington, Somerset following his victory. 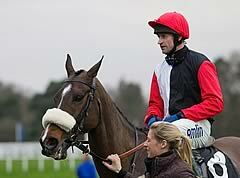 Ballynagour's victory was Pipe's third of The Festival this year. "It's great for everyone involved and all back at the yard - I would have loved to have seen them in the office after we've had the two winners today!" said the trainer. "He's not been the easiest horse to train as he's had a couple of niggles. He bleeds on occasions so we don't do very much with him. We give him an easy life and don't race him too often. "In hindsight, I probably shouldn't have brought him here for the Paddy Power meeting in November - he wasn't properly fit enough to run that day. "Fair play to Allan Stennett (the owner), he has let me do it before in the past and he said that it I wanted to take him to this meeting fresh - we know he runs well fresh - then I should do that. "Allan owned him when he ran in France. He owns a few horses there and he decided to send this horse to see if I could work the magic. "He's a horse who doesn't take too many races so we won't be rushing to do anything. We will just keep watching the DVD. "Tom (Scudamore) is fantastic. I can't do it and he can't do it without the horses. We have the support of the owners - they are spending lots of money and it is great to get the results for them." Jockey Tom Scudamore was also on a high having ridden both Pipe-trained winners today to take his Festival tally for this year to three. "I really enjoyed that, it was fantastic. It's not just the winners, it's about riding the right horses. This horse had so much ability but he just wasn't finishing his races. He did today, didn't he? "He has had bleeding issues. David has done an incredible job again - what a master, what a buzz! "I am going to enjoy today and then see what tomorrow brings. I have four rides tomorrow, all with reasonably good chances. It's a fantastic and I have been very, very lucky." After retiring Big Buck's today, owner Andy Stewart was making plans for Tatenen and a raid on next month's Crabbie's Grand National meeting. The 10-year-old ran a fine race for a 33/1 shot, and was in contention until tiring on the run-in, eventually finishing 14 lengths behind the winner. Tatenen fell in last year's Crabbie's Grand National, and unseated in 2012, but trainer Richard Rowe said the horse was luckless on both occasions. As number 61 in the handicap for the big race, Rowe's horse needs a number to drop out, but the Crabbie's Topham Chase is an alternative. Rowe said: "I thought the handicapper was a little harsh on him after he won at Newbury in November and was put up 12lb, which probably cost him a subsequent win at Sandown - that said if he'd won that day he would have gone up again and we wouldn't be where we are today. "He's run right up to his best and I'm very proud of him because he's quite fragile. When things are right you couldn't get a horse who tries harder and his jumping is super. "He needs a few to come out of the National to ensure a run, but Andy has just said he is keen to let him take his chance. I'll put him in the Topham in case he doesn't look like running in the National. 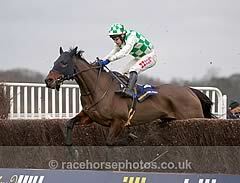 The fences don't worry me, the trip might, but he's been unlucky there in the past and it might be third time lucky."